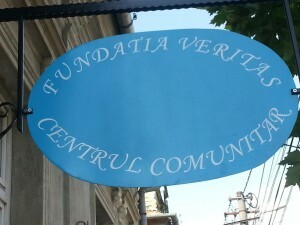 For 10 years, the Veritas social programs were located in a building in the center of Sighisoara. It was not adequate for the number people that were being served, so in 2011 a large property at Strada Horea Teculescu, nr 34-36 was purchased. The move to this property took place in 2013. 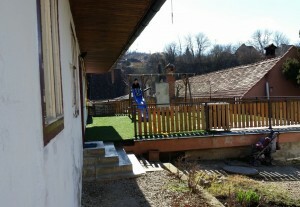 It is 2000 square meters and includes three separate buildings, plus a small apartment for the caretaker and his family. The 1600 cubic meter building houses a large reception area, the director’s office, kitchen, dining room, large meeting and events room (and staff lunch area) and two large rooms for the kids’ club program. From Monday to Thursday Veritas provides about 120 lunches a day and 45 lunches on Friday. The second floor of this building is currently being renovated to add several offices, a large meeting area and classrooms. This section of the main building houses two rooms for the preschool program and an office. Outside the preschool building is a playground area which has a slide, two double swings and a courtyard. This separate building includes a large meeting room equipped with exercise equipment for the Special Needs Club, an office and a small kitchen. A small workshop has been made for storage of tools and equipment for maintenance of the facility. Several garden areas (one a greenhouse) provide vegetables for use in the kitchen. Produce is canned for winter use. An herb and flower garden just outside the kitchen, provides beauty as well as herbs for use in cooking. Another large two-story area of the property is currently being used for storing clothing donations and for a sewing workshop. A large building adjacent to the main Family Center building was built in 1765 and refinished through funding and volunteer workers from the U.S. over a period of three years. Because this is a historic building, workers maintained the original footprint of the building, the shape of the roof, and kept the original windows. 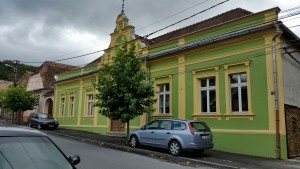 This building houses a counseling center for Floare de colț – a program for abused women, and two rooms which can provide shelter in emergencies for these women and their children. The building is also the location for one of the elderly clubs two mornings a week, and the daily program (Mon. – Thurs.) for people with disabilities. It includes an office for the director of the Social Service programs and a kitchen, to help special needs clients develop skills for independent living. A multipurpose room on the second floor is one of the spaces used by the teen group.